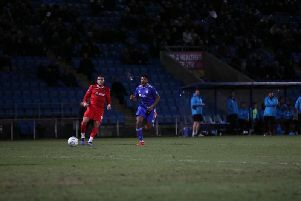 Danny Clarke goes for goal in Town's 1-0 defeat at home to Barrow last season. FC Halifax Town host Barrow on Tuesday (7.45pm) as their home campaign in the 2018-19 season gets underway. Both teams go into the game on the back of opening-day wins against newly-promoted sides, with Halifax beating Braintree 2-0 and Barrow winning 3-0 against Havant and Waterlooville. Halifax debutants Jonathan Edwards and Nathan Clarke were on the scoresheet at Braintree, and new signings Jack Hindle (2) and Sheffield United loanee Tyler Smith also got the goals for Barrow. Hindle, a former Colwyn Bay striker, struck a superb left-footed effort from the edge of the area for his first, while his second was another shot from range that the visiting keeper let slip through his grasp. Ian Evatt’s side are a full-time set-up, and featured 10 debutants on Saturday, lining-up in a 4-3-3 formation, including midfielder Josh Kay, who was linked with a move to Halifax this summer after being released by Chesterfield. This is Evatt’s first permanent job in management, having been caretaker-manager at Chesterfield at the end of last season. Barrow beat Halifax 1-0 at The Shay last season, thanks to Jordan White’s 69th minute goal.